Italian chemist Luigi Garlaschelli and his team used the same type of linen. First they aged the cloth with heat, using a normal oven, and washing it with water. The shroud was placed over a student covered in red ochre, using a mask that simulated Jesus' alleged physiognomy. They kept aging and washing the shroud, adding the necessary blood stains in the process. 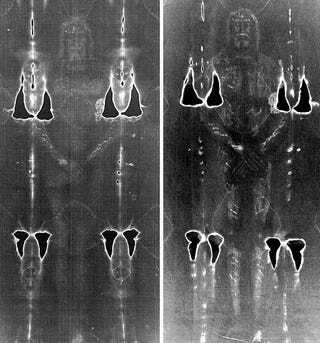 This easy to do, inexpensive one-week process resulted in exactly the same look as the Shroud of Turin, which has been repeatedly proven to be a fake made around the 14th Century using different dating techniques. Many still believe that the shroud has unexplainable characteristics that cannot be reproduced by human means. But the result obtained clearly indicates that this could be done with the use of inexpensive materials and with a quite simple procedure. If they don't want to believe carbon dating done by some of the world's best laboratories they certainly won't believe me.